One hundred years ago the spring offensives of the First World War married combined arms tactics with industrial age technology and nationalism. The four year-long learning competition produced a transformation in warfare, if not a revolution. Integration of artillery, machine guns, tanks, and airplanes presented both challenge and opportunity. Today, the information age offers new challenges and opportunities. Cyberspace, advanced computing, mobile networks, unmanned systems, and social media present a military revolution in information warfare. To leverage its full potential, the U.S. military requires a cultural change to reconcile institutional aversion toward non-lethal information warfare. To aggressively shape, influence, control, and manipulate information, change is needed in U.S. military attitudes toward information warfare. This can be realized through better training and education, and deliberate integration of information operations across the military services during planning and operations. Information is now the seventh joint function. Its efficacy depends upon the ability to transition practical concepts into fundamental underlying logic. Joint Publication 3-13, Information Operations, defines information operations as the “integrated employment, during military operations, of information-related capabilities in concert with other lines of operation to influence, disrupt, corrupt, or usurp the decision making of adversaries and potential adversaries while protecting our own.” As U.S. Secretary of Defense James Mattis has pointed out, the addition of information as a joint function recognizes its power to support military operations, particularly in the wake of modern technology and social media. As a joint function, information will garner additional advocacy and proponency among the joint force, and greater incorporation into plans and operations. Information is both a resource and a weapon. The battlefield of tomorrow is compressed in time and space. When enemy actors are simultaneously operating in space, cyberspace, and across the electromagnetic spectrum, reacting in real time will become a challenge on an interconnected battlefield. As historian Christopher Rein has pointed out, the addition of space and cyberspace as warfighting domains “has expanded exponentially and greatly complicated” information operations. The application of information as an instrument of war is not new, but the American military struggles with information operations. Information is ubiquitous, yet frustrates American military planners and practitioners. Information operations range from deception and cyber activities to public affairs, but traditional American military strength often relies upon overwhelming air power, fire, and maneuver. The so-called American way of warfare is characterized by the application of joint fires within a highly integrated command and control network to rapidly destroy enemy formations and command and control nodes. The American way of warfare has a successful track record in battle, but also belies a persistent inability to ruthlessly exploit the information environment at the strategic, operational, and tactical level. U.S. military campaign strategy is not comfortable with maneuver in the information space. The U.S. military has a penchant “to find it easier—from a capabilities, policies, and authorities perspective—to drop ordnance on a target rather than generating other less-lethal, less-irreversible, and less-transparent effects.” Yet, as the Secretary Mattis remarked in 2009, “Capturing the perceptions of foreign audiences will replace seizing terrain as the new high ground for the future joint force.” Discomfort in the realm of information operations is a challenge that must be overcome. U.S. military discomfort with information operations extends beyond tactics and operations. For example, the U.S. State Department is only mentioned twice in Joint Publication 3-13. This heightens the perception of “a persistent bifurcation in American strategic thinking… in which military professionals concentrate on winning battles and campaigns, while policymakers focus on the diplomatic struggles that precede and influence, or are influenced by, the actual fighting.” The limited reference to the diplomatic instrument of national power belies the need for close cooperation. Given the power of modern communications to shape the information environment, even tactical information operations can create strategic effects. Thus, as the U.S. military begins to consider information as a distinct warfighting function, it cannot neglect the critical linkage to grand strategy and the other instruments of national power. If war is driven by policy, which is in turn influenced by information, the military should anticipate and address underlying assumptions regarding U.S. civil-military relations. For instance, the video and imagery showing the devastation on the Iraqi highway of death by the media during the first Gulf War is considered a significant factor in the cessation of coalition attacks. In other words, while the military develops its capacity for information operations, senior leaders must contend with the need to ensure plans and operations support and complement national objectives. Exploitation of the information environment has occurred throughout the history of warfare. The First World War featured the extensive use of information operations, including the first use of electronic warfare through the interception of wireless communications. When the war began, Great Britain, then the hub of global communications, cut telegraph cables to Germany. This led to a communications blackout for the Germans. German telegraphs had to be routed through British-controlled lines, leading to the discovery of the Zimmerman telegram. During the First World War, the Germans also leveraged information in novel ways. In April of 1917, Germany accelerated the fall of the Russian monarchy by loading a train bound for Petrograd with human malware; a virus of sorts in the form of Vladimir Lenin. As the German army fought the Russians along the eastern front, Lenin hastened the collapse of a Russian monarchy already reeling from inept leadership and repeated military defeat. The German use of Lenin as a weapon to influence Russian behavior appears almost quaint by the scale of later efforts. Generally, the U.S. military gravitates towards the use of information to support kinetic solutions. The emergence of the so-called information revolution in military affairs in the 1990s led the services to use information to strike targets faster and more accurately through concepts such as net-centric warfare and effects-based operations through networking, sensors, computers, and satellites. The American military is less inclined to leverage information with cunning and guile before or during operations. Many have characterized the use of deception, for example, as ad hoc at best. This indicates the tenets of Sun Tzu, Clausewitz, and Boyd are not fully accepted. Used to its full potential, information operations can prepare the battlefield and set the conditions for victory. Information can soften the enemy’s will to fight, deceive, and pollute his or her decision making cycle. Given the variety of media capable of using information to influence, coerce, or deceive, it is conceivable information operations may surpass fire and maneuver in importance at times. Yet influencing a foreign audience cannot be accomplished ad hoc without study and preparation of culture, history, and language. New institutional arrangements may be in order to fully resource requirements for successful information operations. The explosion of the information landscape and technological information-related capabilities presents myriad challenges. Clausewitz may even agree that “violence, like Twitter, is a means of communication.” Whole populations can be reached through social media and influenced in real-time. However, Antulio Echevarria has noted the “American style of warfare failed to internalize Clausewitz’s contention that war was the continuation of politics by other means.” This artificial separation between war and politics presents myriad obstacles in the execution of information operations. In the early phases of combat operations, web-connected devices can be scraped for metadata and surveilled. Military and interagency collectors can map the information space, to include information systems, public networks, and other sensors and emitters. Commanders will require a visualization of the information space through a common informational picture. Commanders and planners will need real-time access to this information. Ethical dilemmas will arise given the need to target enemy information systems embedded within civilian infrastructure. The speed of a non-lethal operation to influence, degrade, suppress, or deny the enemy access to information will be measured in minutes or hours, not days or weeks. The tools and authorities needed for these actions at lower tactical levels are a largely uncharted territory. The growth of cyberspace has increased the surface area of the battlespace. Potential attack vectors have multiplied and grown in complexity. Amy Zegart has described five categories of cyber actions: stealing, spying, disrupting, destroying, and deceiving. These cyber threats can be brought to bear on U.S. forces in large scale combat operations in varying degrees. The sheer speed of a cyber action reduces an effect to mere seconds. Given the scale of networked devices on a battlefield and on the home front, the scope of attacks to defend increase exponentially. The long-term method to close the gap in the political-military divide is professional military education. Many historians argue the quality of service members, and their ability to think and adapt, are leading indicators of success in war. As Williamson Murray has written, “The acid test of military effectiveness was whether one could handle not the expected but the unexpected elements thrown up in war.” Notably, the National Defense Strategy states U.S. military professional military education has stagnated. Hence, professional military education for both enlisted personnel and officers is critical. Similarly, educational opportunities should be made available to civilian policy makers and diplomats. An even better solution would provide an opportunity for mid-grade and senior officers and civilians to learn from one another. More than one thousand students are educated annually at the U.S. Army Command and General Staff Officer Course at Fort Leavenworth. Only a small fraction consist of civilian and interagency students. The benefits to training against realistic threats in live field exercises are self-evident. As Frederick the Great noted, “theory facilitates practice.” Thus, the practice must apply the theory in a realistic manner. Results must then be recorded, analyzed, and improved upon. The consequences for inattentiveness are dire. During the First World War, the British Expeditionary Force “did not possess a system for frequent re-examination of tactical methods and operational doctrine.” As a result, improvement was haphazard and incoherent. Journalist David Patrikarakos, in his book War in 140 Characters, argues information technology and social media has fundamentally “destabilized classical forms of war.” In recent conflicts in Libya, Syria, and Ukraine, observers have noted how information technology and social media are able to preempt, confirm, or deny the facts on the ground faster than through military or government means. During an exercise in 2016, a lone platoon of Marines acting as an opposing force (OPFOR) significantly disrupted the operations of a much larger conventional Marine Corps unit. Using commercially available technology consisting of drones, video cameras, and jammers, they consistently leveraged information operations to influence, corrupt, or disrupt the decision making cycle of their opponents. …an enemy artillery shell or intercontinental ballistic missile need not range the homeland, only fiber optic cables and satellites. Defensive measures must also anticipate the homeland. Given American reliance on information for all aspects of daily life, an enemy artillery shell or intercontinental ballistic missile need not range the homeland, only fiber optic cables and satellites. The term infocalypse has been used to describe such an event. Emerging so-called deepfake videos have the potential to pose a threat to governance and public confidence, undermining government and military leaders. Using widely available and increasingly sophisticated software, deepfakes manufacture realistic video of politicians and celebrities with fabricated dialogue. Ubiquitous media is a significant blindspot for an open society. The largest study of fake news found that falsehoods penetrated “further, faster, and deeper” into the social network than accurate information on Twitter. An erroneous tweet by a state government employee set off panic and alarm across the Hawaiian Islands. Evocative information travels fast, anything that arouses emotions will rapidly pick up speed. What if a media-owned or third-party drone or satellite broadcasts dead and dying Americans to domestic audiences in high definition? This presents significant informational questions military strategists and operational planners need to consider. In 1996, a U.S. Army Command and General Staff College student lamented the encroaching effect of media on war, observing, “If a few soldiers are killed or wounded, the media judges the whole operation a failure…we’re too restricted now.” In the future, this perception will have to be overcome to ensure freedom of action across all domains, to include information. While professional military education is one way to address present challenges, the services and combatant commands must also better organize themselves to act in the information domain. The U.S. Marine Corps has made a concerted effort of late, establishing an Information Group with each Marine Expeditionary Force (MEF). However, organization is only the first step. Each Marine Expeditionary Force Information Group (MIG) must develop new tactics, techniques, and procedures to conduct information operations to achieve objectives beyond simply closing with and destroying an enemy. The placement of information on a higher plane in the hierarchy of warfare will require a paradigm shift in how the U.S. plans, prepares, and conducts war. As Ian Brown has said, the U.S. should “aim to fight in the realm of moral warfare.” While adversaries such as the Russians have long since integrated deception or maskirovka into warfare activities and professional training, the U.S. military is not built this way. Clint Watts, an expert in information warfare, summarized the dichotomy between Americans and Russians: “Russians are brilliant at [information warfare] because they don’t see it as a subcomponent of warfare, it is warfare.” In contrast, American hubris has arisen from “decades of having overwhelming military capabilities.” While weaker states often leverage information operations to defeat a stronger opponent, the U.S. military cannot presume unfettered martial superiority in all domains at all times. General Robert Neller, the Commandant of the Marine Corps, has said future conflict is “…going to be a land, air, sea operation, but it’s going to involve space, it’s going to involve information, it’s going to involve the electromagnetic spectrum; all the things that we haven’t had to think about in the past 15 to 20 years.” The West in general and the U.S. military in particular are nowhere near as agile as their adversaries in the information sphere. Tactical, operational, and strategic success requires a cultural change to reconcile institutional aversion and reluctance toward non-lethal information warfare. To dominate the information domain before, during, and after the next conflict, significant change is required in the U.S. military’s approach toward training and education of information as a warfighting function, and information operations as a discipline. Nick Brunetti-Lihach is a Marine Corps Communications Officer currently serving as a Faculty Advisor at the Marine Corps Expeditionary Warfare School. Views contained in this post do not represent the United States Marine Corps, the Department of the Navy, or the Department of Defense. United States, “Joint Publication 3-13: Information Operations” (Washington, DC: November, 2014). Secretary of Defense James N. Mattis, Memorandum, “Information as a Joint Function,” September 15, 2017. Christopher M. Rein, “Weaving the Tangled Web: Military Deception in Large Scale Combat Operations,” Military Review (September-October, 2018), 13. Max Boot, “The New American Way of War,” Foreign Affairs (July/August 2003). Bradley L. Rees, “Dismantling Contemporary Military Thinking and Reconstructing Patterns of Information: Thinking Deeper About Future War and Warfighting,” Small Wars Journal. http://smallwarsjournal.com/jrnl/art/dismantling-contemporary-military-thinking-and-reconstructing-patterns-information accessed 9 May, 2018. Antulio J. Echevarria II, “Toward An American Way of War,” in Strategic Studies Institute (Carlisle, PA: USAWC, March 2004), 7. Echevarria, Toward an American Way of War, 17. Stanley T. Kresge, “Gulf War Termination Revisited (Air War College, Maxwell Air Force Base, Alabama: April, 1999), 8. Jonathan B. A. Bailey, “The First World War and the birth of modern warfare,” The Dynamics of Military Revolutions: 1300-2050, ed. MacGregor Knox and Williamson Murray (Cambridge University Press: New York, 2001), 147. Gordon Corera, “How Britain Pioneered cable-cutting in World War One,” BBC. 15 December, 2017. http://www.bbc.com/news/world-europe-42367551 (accessed April 3, 2018). Ted Widmer, “Lenin and the Russian Spark,” The New Yorker. 20 April, 2017. https://www.newyorker.com/culture/culture-desk/lenin-and-the-russian-spark (accessed 4 Nov 2018). Christopher M. Rein, “Weaving the Tangled Web: Military Deception in Large Scale Combat Operations,” Military Review (September-October, 2018), 10. United States, “U.S. Marines in the Persian Gulf, 1990-1990-1991 with Marine Forces Afloat in Desert Shield and Desert Storm,” (History and Museums Division: Washington, DC, 1998); United States. Congressional Research Service Report for Congress, Military and Civilian Satellites in Support of Allied Forces in the Persian Gulf War (Washington, D.C., 27 February, 1991), 11. Michael Kofman, “Raiding and International Brigandry: Russia’s Strategy for Great Power Competition.” War on the Rocks. June 14, 2018. https://warontherocks.com/2018/06/raiding-and-international-brigandry-russias-strategy-for-great-power-competition/ (accessed 4 Nov, 2018). Joseph Cox, “Russia Built an Underwater Cable to Bring its Internet to Crimea,” Motherboard. 1 August, 2014. https://motherboard.vice.com/en_us/article/ypw35k/russia-built-an-underwater-cable-to-bring-its-internet-to-newly-annexed-crimea (accessed 4 Nov, 2018). Ben Sohl, “Influence Campaigns and the Future of International Competition,” The Strategy Bridge. 12 September, 2017. https://thestrategybridge.org/the-bridge/2017/9/12/influence-campaigns-and-the-future-of-international-competition?rq=Gerasimov (accessed 4 Nov, 2018). Brian McAllister Linn, “The U.S. Armed Forces’ View of War,” Daedalus (140, no. 3 2011), 45-46. Antulio J. Echevarria II, “Toward An American Way of War,” in Strategic Studies Institute (Carlisle, PA: USAWC, March 2004), 13. Stephen Rosen, “How Innovation Happens in the Military” (Podcast), 2017, https://mwi.usma.edu/mwi-podcast-innovation-happens-military-professor-stephen-rosen/ (accessed May 9, 2018). T.S. Allen, “The Once and Future InfoWars,” War on the Rocks. 27 March, 2018. https://warontherocks.com/2018/03/the-once-and-future-infowars/ accessed 8 April, 2018. Antulio J. Echevarria II, Reconsidering the American Way of War, 25. Amy Zegart, “Horns of a Dilemma: Even Cybersecurity is bigger in Texas,” (Podcast), 2018, https://warontherocks.com/2018/03/horns-of-a-dilemma-even-cybersecurity-is-bigger-in-texas/ (accessed May 9, 2018). Paul Kennedy, “Military Effectiveness in the First World War,” ed. Allan R. Millett and Williamson Murray, Mershon Center, The Ohio State University, Boston, 333. David Barno and Nora Bensahel, “Jim Mattis Fires a Clear Warning Shot,” War on the Rocks. 20 March, 2018. https://warontherocks.com/2018/03/jim-mattis-fires-a-clear-warning-shot/ accessed 8 April, 2018. Jay Luvaas, “Frederick the Great: The Education of a Great Captain” in H100 Book of Readings (Fort Leavenworth, KS: USACGSC, August, 2018), 79. Paul Kennedy, “Military Effectiveness in the First World War,” Military Effectiveness Volume I: The First World War, ed. Allan R. Millett and Williamson Murray (Mershon Center: Boston), 346. 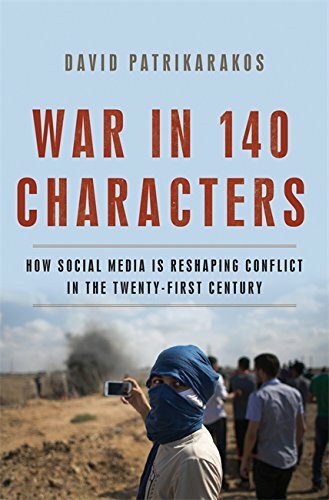 David Patrikarakos, War in 140 characters: How Social Media is Re-shaping Conflict in the Twenty-First Century (Basic Books: New York, 2017), iii. Luke G. Cardelli, “MAGTF Integrated Exercise 16 (MIX-16), Marine Corps Gazette (101 no. 11, November, 2017). Charlie Warzel, “He Predicted the 2016 Fake News Crisis. Now He’s worried about an Information Apocalypse,” BuzzFeed News. 11 February, 2018. https://www.buzzfeed.com/charliewarzel/the-terrifying-future-of-fake-news?utm_term=.oidqDJ3JMw#.hrW2bk4ke8 accessed 8 May, 2018. Craig Silverman, “How to spot a deepfake like the Barack Obama-Jordan Peele Video,” BuzzFeed News. 17 April, 2018. https://www.buzzfeed.com/craigsilverman/obama-jordan-peele-deepfake-video-debunk-buzzfeed?utm_term=.ts3AxBeBzr#.ggaBokPknK accessed 9 May, 2018. Robinson Meyer, “The Grim Conclusions of the Largest-Ever Study of Fake News,” The Atlantic. 8 March, 2018. https://www.theatlantic.com/technology/archive/2018/03/largest-study-ever-fake-news-mit-twitter/555104/ accessed 9 May, 2018. Erik Ortiz, Phil McCausland, and Chelsea Bailey, “Hawaii ‘ballistic missile threat alert’ to phones was false alarm, officials say,” NBC News. 13 January, 2018. https://www.nbcnews.com/news/us-news/hawaii-ballistic-missile-threat-alert-phones-was-false-alarm-officials-n837511 (accessed 4 Nov 2018). Robert D. Kaplan, “Fort Leavenworth and the Eclipse of Nationhood,” The Atlantic. September, 1996. https://www.theatlantic.com/magazine/archive/1996/09/fort-leavenworth-and-the-eclipse-of-nationhood/376665/ accessed 2 May, 2018. Ian T. Brown, “Warfighting 2.0,” The Marine Corps Gazette, 67. Clint Watts, War on the Rocks Podcast, August, 2018. Mark F. Cancian, “Coping with surprise in Great Power Conflicts,” Center for Strategic and International Studies (Washington, D.C.: February, 2018). Rein, “Weaving the Tangled Web,” 13. Mark Pomerlau, “Marines take multi-domain battle to the littorals,” C4ISRNet, 21 September, 2017. https://www.c4isrnet.com/digital-show-dailies/modern-day-marine/2017/09/21/marines-taking-multi-domain-battle-to-the-littorals/ (accessed 4 Nov 2018). Newer PostIsrael's Nuclear Ambiguity: Would a Shift to Selective Nuclear Disclosure Enhance Strategic Deterrence?